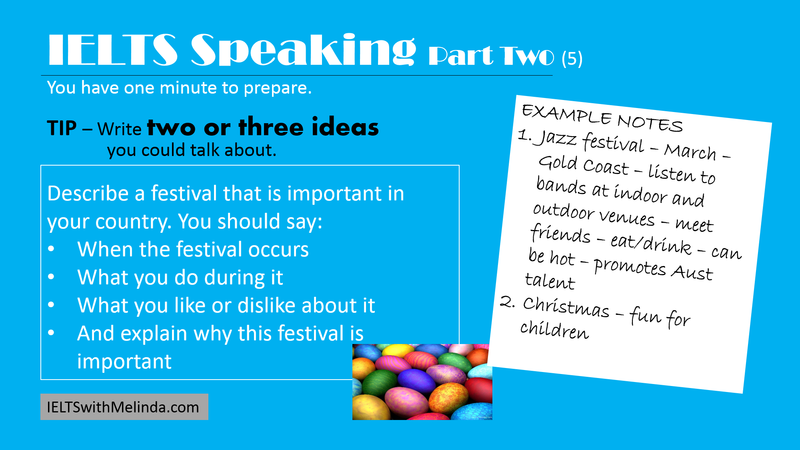 In part 2 of the Speaking Test you will need to speak about a topic for 2 minutes. You’ll be given a card and you’ll have one minute to take some notes. Many candidates don’t take notes. That is a mistake! My advice to you is TAKE NOTES. In fact what you need to do is to think of 2 or 3 examples you could talk about. The topic on the card below is one that I don’t like. Festivals aren’t very big in Australia and it is not a topic I’m particularly interested in. So what can I do in the test? I could panic and think, “What a terrible question. I don’t want that question!” Or, I could deal with it. In Part Two of the speaking test your job is to speak for 2 minutes. Sometimes a topic can be difficult for you. Sometimes you run out of ideas while you are speaking. You are given 1 minute to write some notes. Use that minute effectively! Write down 2 or 3 ideas that you could talk about. If you run out of ideas about your first topic while you are talking, then you can say, “Another example is, …” and use your second example. And if you need it later, use your third example. How will you know when you have spoken for long enough? Easy. The examiner sill stop you. If the examiner stops you, that’s a good thing. It means you have spoken for 2 minutes. Phewwww! Well done! OKAY, now it’s your turn. Turn on your smartphone, spend one minute taking notes and then record yourself speaking for 2 mins. Later, listen back. What did you do well? What could you improve? 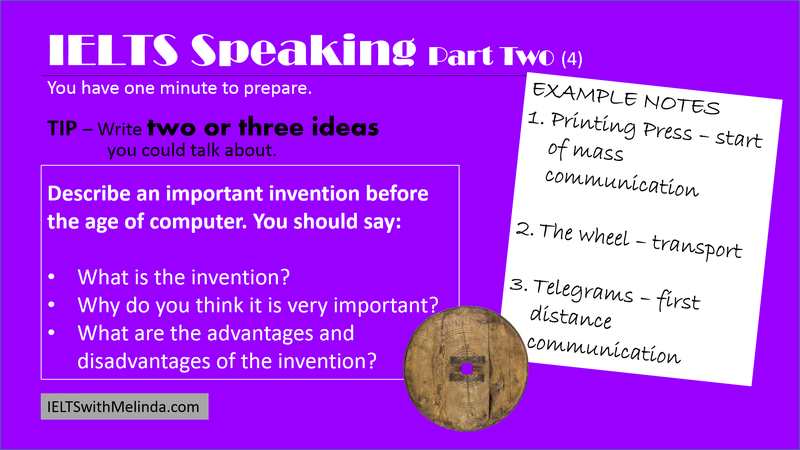 Follow-up Questions which the examiner may ask: What is the significant impact of modern inventions on life? Which skills do you want to study in the future? Do you think modern inventions are enjoyed equally by people in the city and people in the countryside? Fillers are words, sounds or phrases that we use in normal speaking. They give us a bit of time to think while we are speaking. Your speaking will sound more natural if you use them correctly. Start using them now. Practice. In Part Two you are given one minute to prepare. Use this time effectively. 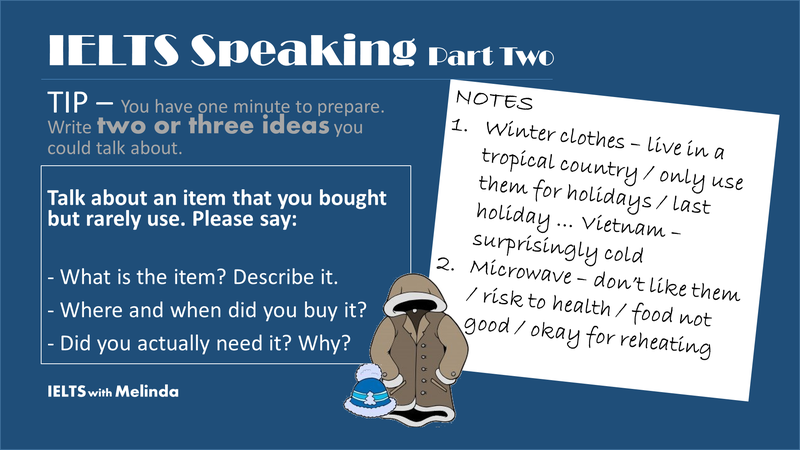 Write down two or three examples of topics you could speak about. See the example below. Now you try it. Based on the topic, write down two or three ideas of your own. Try this topic now. Take out your watch and your smart phone (to record yourself). You have one minute to prepare, then you must talk for two minutes … Go! 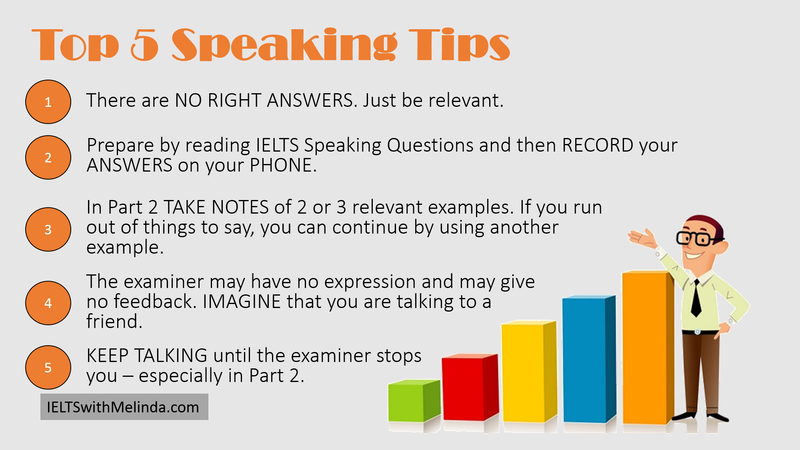 In Part Two you need to speak continuously for 2 mins. This can be hard if you haven’t practised, but not so hard if you practise carefully. You are given one minute to prepare. An important strategy is to use this time effectively. Use the minute to write down two or three examples you could talk about. (See the example NOTES in the picture below.) Having one idea may not be enough! A lot of people do a great job for about 40 seconds and then they run out of ideas. If you run out of ideas, you need to say … “and another example of … is” and then you will have more to talk about. ALWAYS use the minute preparation time EFFECTIVELY. Try this topic now. Take out your watch and your smart phone (to record yourself). You have one minute to prepare … from … Now! 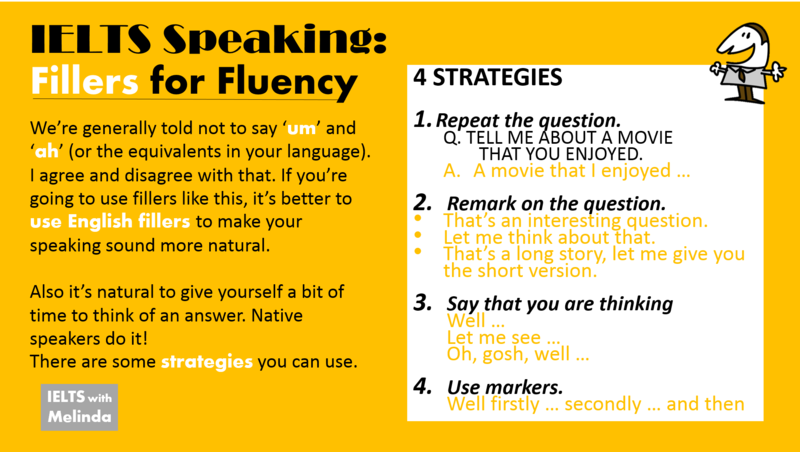 Did you know that 25% of your mark in the speaking test is for FLUENCY? You can make your language sound more fluent by using fillers. Fillers are little words, sounds or phrases that give you a moment to think. If you use them correctly, your English sounds more natural and more fluent. Examiner: Tell me about your home town. 1. Um, my hometown. Let me see. In the first example above, the speaker has used a filler, then has repeated part of the question and then added another filler. It’s a good strategy. Why are there so many llllllls on ‘well’ in the second example? Welllll, that’s because we often stretch out that final sound as an indication that we are thinking.